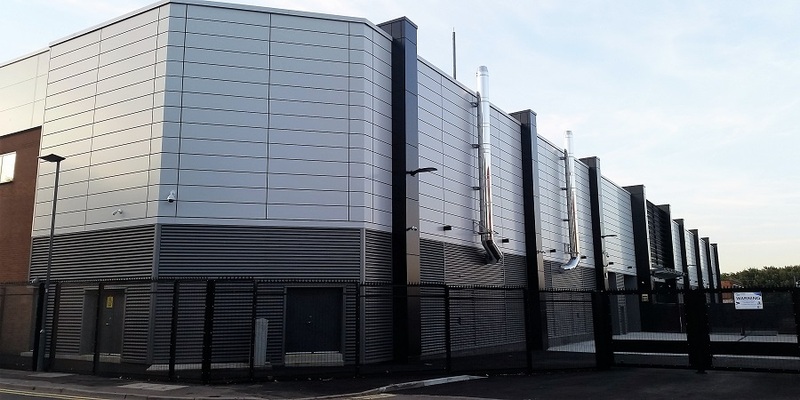 The first carrier neutral data centre in central Birmingham opened in the summer of 2016 with phase one offering an initial hall of 1.5MW customer power or 10,000 sq ft net, with a second similar size hall ready for fitting out. Pure Data Centres Group developed the site which is now wholly operated by GTP3 Data Centres, led by Sandeep Sharma (ex Virtus Stream). The site is also one of the few in the UK to have an official UTI (Uptime Institute) Tier 3 Design Certification. UK managed services provider 6 Degrees are the initial tenant and offering a full suite of services from simple colocation at one rack (or less) through to fully managed solutions. Located only a mile to the east of Birmingham’s New Street Station the site comprises a 5 acre parcel of land bounded by Great Barr Street to the north, Glover Street to the west. The first phase offers two data halls each of 10,000 sq ft, the first of which is fully fitted on opening and the second hall ready for fit out. The building itself is on a single level and offers some fairly impressive board room/meeting rooms and break out facilities for customers. Ample off street parking inside the site security perimeter. The longer term plan includes a second similar sized data centre building (3MW/20,000 sq ft net) on the site. The area has ample network in situ and our site survey in August 2016 found evidence of Tanet (now part of Level3 or Centurylink) and Fibreway (now part of Sky). Initial carrier network in the building includes BT, Virgin Media and Zayo as well as managed services from 6DG (6 Degrees).